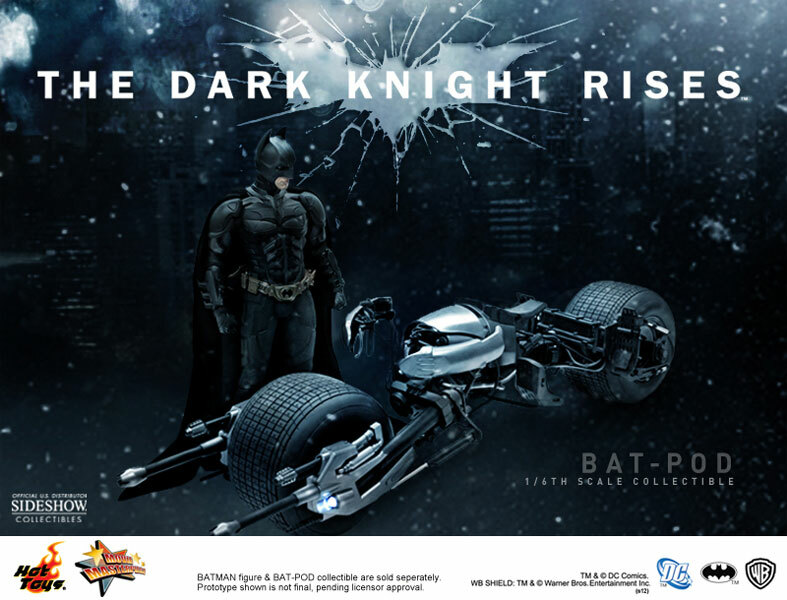 Fruitless Pursuits: Hot Toys Dark Knight Rises Bat-Pod Available for Pre-Order! 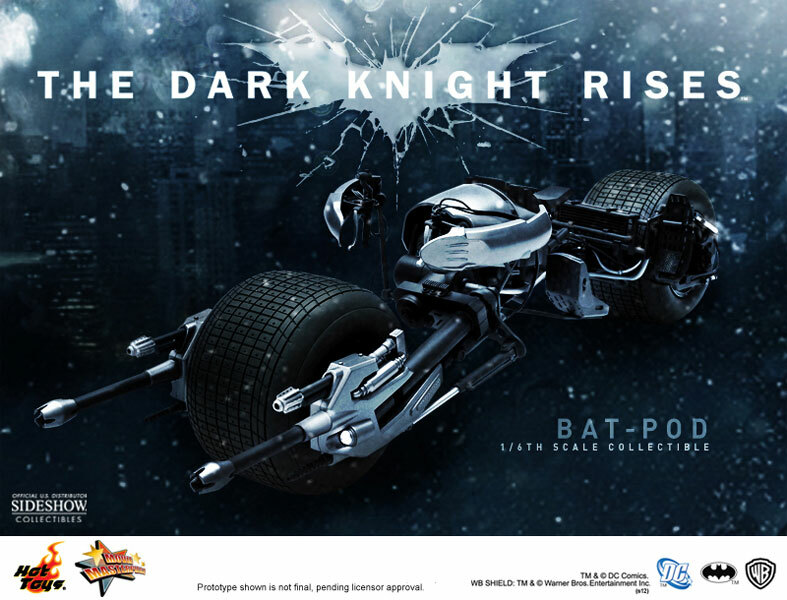 Hot Toys Dark Knight Rises Bat-Pod Available for Pre-Order! The first of Hot Toy's much anticipated The Dark Knight Rises 1/6th scale product is up for pre-order right now, and what do you know - it's the iconic Bat-Pod! Batman's sleek, skinny, huge-wheeled motorcycle which he rides like he's making love to it! In fact, I think that's how it got the name "Bat-pod", because it crushes Batman's pods while he's riding it! 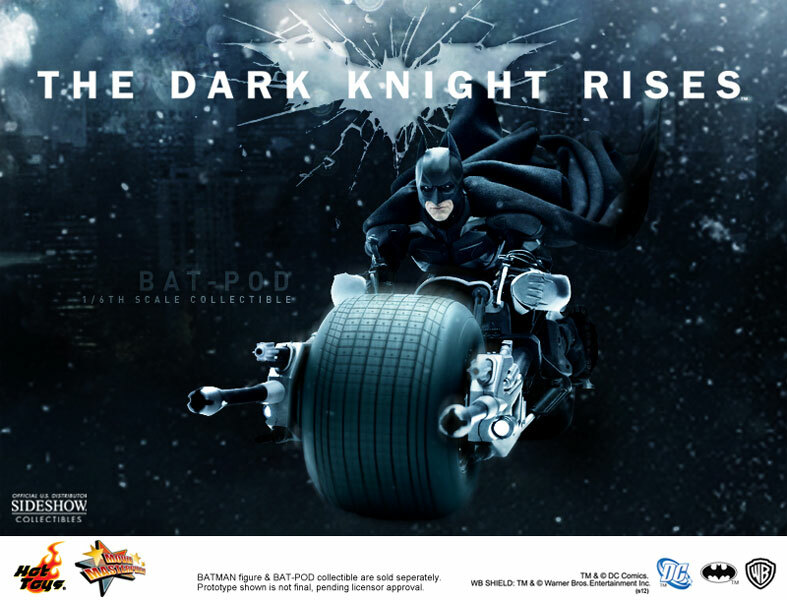 Early promo images also revealed that Catwoman is going to get to make love to it too, so it could prove to be an important vehicle in the film. Join me after the jump for a few more action (and in-action) images and thoughts! And this should give you a better sense of the scale. It's actually pretty massive. And this is a great way to display him. Providing of course that your shelves are two feet deep. I'm nearly as intrigued about this line as I am with The Avengers. 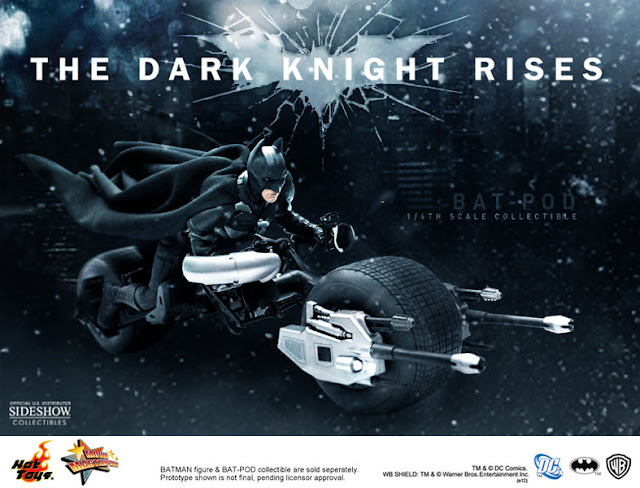 I already own a Hot Toys Batman Begins Batman/Bruce Wayne, and will probably pick up a Hathaway Catwoman if it's decent (which I'm sure it will be). Kind of pissed now that I never got a Heath Ledger Joker. And here's the Michael Keaton Batman: Hot Toys DX Series Batman Collectible Figure (1989 Version) which I've also seen on shelf in a few stores. Report: Giant Lego Fan Display! Dawnguard! Skyrim DLC Trailer is Full of Manbats! Limited Hot Toys Iron Man Mark VI In Stock NOW! Announcing Pixel Lincoln: The Deckbuilding Game! The Greyboy Allstars "Still Waiting"
Review: Nanoblock is like Microscopic Lego! New Mini Episode of The Book Was Better Podcast! F**k Yeah Game of Thrones! Episode 9: Blackwater! Tuesday Bounty: Glorious Bounty is Electrifying!